316 marine grade steel buffed and polished. Drilled and countersunk on 6" centers. Gauge: .077Size: .. Designed for use without an insert. Easy tight radius bending as well as providing strength and prot.. Stainless steel type 304 and highly polished. Size: 12" L x 3/4" WFastener: #8.. Stainless steel type 304 and highly polished. Size: 18" L x 3/4" WFastener: #8.. Stainless steel type 304 and highly polished. Size: 24" L x 3/4" WFastener: #8.. Stainless steel type 304 and highly polished. Size: 8" L x 3/4" WFastener: #8.. Accepts flexible insert. Designed for use with flexible vinyl inserts. Easy tight radius bending as ..
Soft durometer provides cushion effect to absorb impact. Tight radius bending can be made with no he.. Flexible and Durable. Continuous coil allows for one piece installation without seams. Tight radius ..
All-in-One Kit Includes:Flexible vinyl rub rail, insert and end caps along with screws and an instal..
5-year warranty. Size: 1/2" x 50' LColor: Black..
5-year warranty. Size: 3/4" x 50' LColor: Black..
5-year warranty. Size: 1" H x 1/2" W x 50' LColor: Black..
5-year warranty. 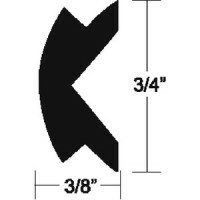 Size: 15/16" H x 3/8" W x 50' LColor: Black..
5-year warranty. Size: 3/4" H x 3/8" W x 50' LColor: Black..
5-year warranty. Size: 5/8" H x 5/16" W x 50' LColor: Black..
5-year warranty. Size: 1-3/16" H x 1/2" W x 50' LColor: Black..
5-year warranty. Size: 3/4"H x 3/8" W x 50' LColor: Black..
5-year warranty. Size: 1/2" x 50' LColor: White..
5-year warranty. Size: 1" H x 1/2" W x 70' LColor: Black.. Ideal for boats up to 25'. Popular rub rail with the boat builders. Rigid PVC withstands the harsh m.. Excellent general purpose rub rail. Rigid PVC withstands the harsh marine environment. Very easy to ..
Rub rail end caps 2/cd Pack: 2Size: 1-9/16" WColor: Black..
Polyester covered and wears over 10 times longer than similar products. Will not rot in the sun or m..